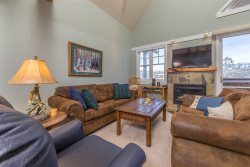 The Cozy Bozeman Cottage on West Olive is perfectly situated between downtown Bozeman and Montana State University. It has all new furniture and was recently remodeled to add large bright windows and expose the original hardwood floors. It’s the perfect vacation rental for one to four adults or your little family. The great room includes comfy seating and a flat screen TV with cable and WiFi. There is also a corner secretary desk where you can work, then leave your computer out of sight when not in use. The drop leaf dining table is set up for a cozy dinner for two or can be expanded to entertain six people. The modern, roomy kitchen has bar seating for two and all stainless appliances. It is light and bright. The exterior kitchen door takes you to the fenced back yard, which is a quiet retreat after a busy day exploring everything the Gallatin Valley has to offer. You will find a dining table and chairs under the cool shade trees or move to the bright sun on the roomy patio. Enjoy the patch of grass for play and use the new shed for storing your bikes, kayaks or skis. Each bedroom has a new queen-sized bed and views of the private, fenced back yard. The bathroom has a tub/shower and ample storage in the linen alcove. A washer and dryer is available for your use down the stairs from the kitchen. West Olive is in a nice convenient neighborhood located two blocks south of Main Street and the Community Food Co-op; and three blocks NW of Cooper Park, with easy access to Montana State University and downtown Bozeman. You will never forget your Bozeman experience staying in this home!